[New for 2013] Weight Watchers contacted me a few weeks ago and asked if it would be ok to send over some free samples, and not just any samples, but all six of their new products. Ofcourse I happily accepted because like I've always said, you can't eat the premium stuff all the time. You should never be afraid to mix things up because often the nutritional info of these lighter snacks easily offsets any non-premium features they might have. 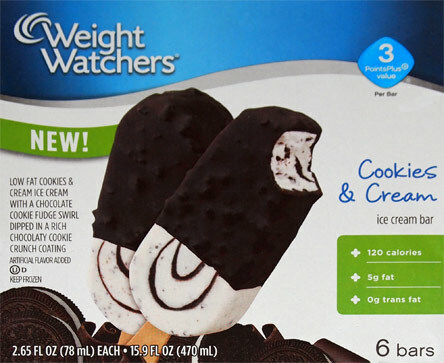 These are Weight Watchers new Cookies & Cream Ice Cream bars. Nick is pretty much always a fan of these WW bars, so I think it's more than high time that I tried some for myself. Plus, as a huge fan of cookies and cream, these are right up my alley with "low fat cookies & cream ice cream with a chocolate cookie fudge swirl dipped in a rich chocolatey cookie crunch coating". Let me start by saying I adore the idea that there are cookie bits in the coating. Right off the bat, I'm excited to try this treat. Now you've probably noticed that the shell photographed really dark, and guess what? It tastes dark too. It's so dark that I was shocked (and amused) by it's presence Now, on the flip side, I was a little sad that the thin shell doesn't go further down, but thankfully weight watchers has another trick up their sleeve. You see my friend, they've gone all out on this one. 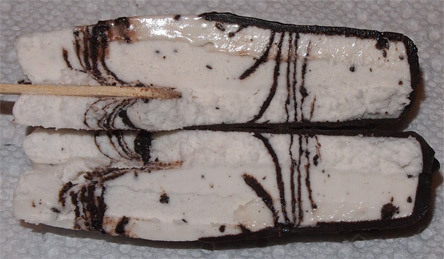 Now hopefully you can see it, but if not, let's flash back to the description: "chocolate cookie fudge swirl". That's right, they shoved cookie bits into the fudge to make a nice gritty swirl. Bonus Points! Ok, what's my usual complaint about low fat treats? I don't like the texture. Well, Weight Watchers has gone above and beyond on this one to make a really fun treat. Yes, these are small. I'm pretty sure I could plow through a box of these, or at least split a box with someone anyway, but at 120 calories, I had no guilt having one of these around 7:30 and another at 9 (hey, it was for the blog). You know, this may be one of the fanciest low fat treats I've had, at least in a while. I'm just not sure what I would compare them too. I mean, they remind me a little of the tofutti hooray bars because of the dark shell, but that's probably not a real comparison. You guys know how I love my gritty textures and they've delivered that here. It's just a neat treat, something you shouldn't be afraid to try. These are delicious. Actually, all of these new Weight Watchers bars are pretty good. I have yet to find the raspberry cheesecake one but really want to. Had one for the first time last night and it was amazing. I guess being on weight watchers makes me enjoy my few treats more than usual...but I honestly believe I would eat these even if I wasn't on weight watchers. They are that good! This tastes great and completely satisfies my desire for high calories and high fat versions of ice cream that we all grew up with. I'm not sure what sweetener they use but I found it to have a harsh burning chemical aftertaste. Will not buy another box.